I always try to write something more or less upbeat on this blog, but this month I had a terrible time. I had opened the paper to see that the administration was gutting EPA, where I have so many friends and colleagues doing such important work. 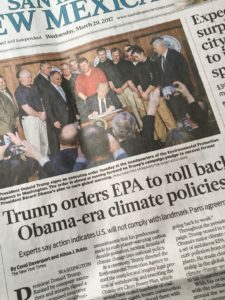 Every story – local, national and global — was filled with despair and foretold the end of more than a healthy environment. I saw our moral fiber crumbling, our values in a shambles, our caring and empathy for each other in rapid decline. The next morning in that half-sleep and half-awake state I had a vision of a postcard I received many years ago. I have found that these flashes from the elusive land between conscious and unconscious are worth paying to attention to. And this one came with a message. Here it is. When my younger son was 7 he went to a music summer camp in the mountains a couple of hours from home. That’s young, but he went with his older brother who had filled him with exciting stories from the year before. Nathan was eager to have those adventures, spend time with all the big kids and learn to play the drums. Halfway through the two-week camp session every kid wrote a postcard home. It was required and we parents looked forward to that reassurance that our child was alive and having fun. So, it was with eagerness that I flipped over the postcard to see what Nathan had written. This is what I read: “Dear Mom, It is hard to write when you are crying so hard, love, Nathan.” The card was smudged – with tears, I was sure. I was filled with guilt that I had sent him away so young and wanted to jump in the car and go get him. But I waited the three days until the camp session ended, believing that if anything were terribly wrong the counselors would have contacted me. We arrived and after much searching found Nathan, cavorting like a young goat on the bandstand with his new friends, laughing and having a great time. We listened to the concert, filled with pride. The drums were especially well played. I think that postcard surfaced in my mind because, like Nathan, it is hard to write when I am crying so hard. The tears may not be smudging my paper, or dropping onto the keyboard, but the loss is there just the same. I, too, want to go home. I admit that this world has been a scary place for quite a while, but it is hard not to believe that we are looking at a new definition of scary. So, to continue the metaphor, is it possible to cavort like a baby goat, on the bandstand with my new friends, the ever-present scariness lurking behind me? It’s not quite that simple, but Roberto and I did do a little cavorting last Saturday. 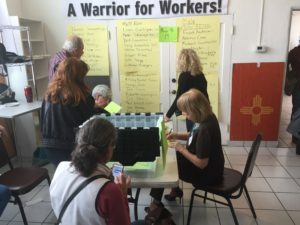 Having been elected to represent our ward last month (see my last blog post), we marched on to the county Democratic Party meeting, our first time ever to engage in grassroots party politics beyond bumper stickers, buttons and contributions. The place was mobbed. Almost 400 representatives from all the wards in the county crammed the union hall to elect the county chair, vice chair and delegates to go to the state convention. There were breakfast burritos, donuts, coffee, and juice. Party hopefuls were eagerly shaking hands, those of us with precious votes to cast were pressing our issues on whoever would listen. Not surprisingly, the median age must have been about 60, but it was a diverse and lively crowd, and the younger ones were not shy. The level of energy was through the roof. And looking back on it, I don’t remember the name of our president being mentioned once. Instead of going to that scary place, the focus was on grassroots people power. All the speeches were filled with optimism and enthusiasm for a future where diversity is welcomed, inclusivity valued, and cavorting encouraged. Lucy, your story of the tear-stained post card certainly evoked a vivid memory for me. I was 11 when I went to an 8 week camp in Maine. I wrote a post card the first week telling my parents to come get me. I had been used to summer freedom on a lake in the Adirondack Mountains of New York, where my brother and I could swim whenever we wanted, take the sailboat or canoe out any time we wanted — in short, paradise. But at camp, there was a 15 minute swim in the morning and a half hour in the afternoon. Bummer! So the postcard was mailed. After the first week, the swim team and canoeing teams were formed, I was on both and had a great time. The postcard was old, forgotten history — until 10 years later when it was finally delivered to my parents. The old post office in North Belgrade, Maine, had recently been torn down and the postcard was found wedged behind a sorting desk — maybe the last penny postcard to be delivered in the United States! Great story, Ken! Thanks. Just the word “postcard” evokes so much. Would love to hear more postcard stories. 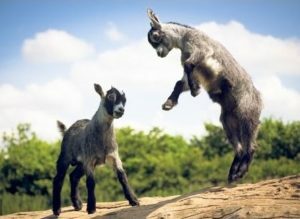 Lucy- I am going to try and thinks of cavorting baby goats everytime my mind starts to focus on the dark events we witness every day. Thank you! …and maybe if we’re lucky and there is such a thing as reincarnation, we’ll be cavorting for real! Lucy, this is spot on as always. And really grabs me because amazingly I had almost the same experience as Nathan, at camp shaver In the Jemez. I was 7 my first year and that first week I sent my mom a tear stained letter asking her to come get me! By the end of the second week I was having such a great time I didn’t want to leave. so things can get better as we get to really know her new environment. In this current political landscape,however, we are going to have to work at it, like you and Roberto! Oh, Seth, I can picture you exactly….and I knew you back then, so this is so vivid. And I love your conclusion that getting to “know” a new environment is the key, tempting as it is to “deny” it instead. Cavorting is not denial but finding the space and time to be optimistic and playful. I love this post. This is the exact attitude I am reaching for these days. I’ve always been a lazy activist but now I use an app called Resistbot which helps me fax my concerns as often as daily to elected officials (https://resistbot.io/). I’m also smiling more by dancing around the house to Aretha, or laughing until I cry watching Lily Tomlin in Grace and Frankie on Netflix. Cavorting is good. Thanks, Lucy! Thanks, Hope, for the link — and the places that inspire you to cavort. What a great way to look at the problem – do something about it. I am proud of you and Roberto for getting more involved. We are seeing the same thing in Virginia with large increases in people attending Democratic party meetings and wanting to get involved. We will make a difference! My only experience with camp was that I did not want to come home. Playing baseball, swimming, and hiking were so much more fun than all the chores I had waiting fro me at home. Thanks, Jeff, good to hear there is energetic participation around the country. And as for summer camp, my postcard home (age 7) read “I rode a horse. I thot it woud be hier.” Crazy, huh? I have been mulling over your blog, and decided it was time for me to “come out” as they say. I’m not sure where or how to begin, but perhaps just being open and speaking from the heart as we advise students that come to restorative practices. I cannot relate to “away at camp” stories because my summers beginning at age 8 started in the bean fields where I earned 12 cents for every bushel, and then as a teen and a bit stronger it was the onion fields, onions are heavier than beans and are put into wooden crates not baskets. Anyway, it continued- on with numerous work experiences through high school, military, and college. As a hydrogeologist maturing professionally through the passage of the EPA, and ultimately working on the preparation and supervision of environmental impact statements for land development and mining companies, I developed an appreciation for both. During the 40 years of work in 15 plus different countries I also gained a love-hate attitude for the EPA. I feel it was and is needed and it has done and continues to do good work. It has however gotten bloated and misguided in its mandate. I do not know what effect Trump’s actions will have, but pray they are not extreme in the other direction. With a country that is 20 trillion dollars in debt I am open to how we can correct that problem. Re-Climate change. Climate change is occurring and has occurred since the beginning of earth. Fifteen short miles from my home is what is known as dinosaur ridge, testimony to a time when the climate was much different than it is today. CO2 is essential for life. It is not the bad actor that is causing “global warming”. I am totally in favor of doing all we can to minimize pollution wherever and in whatever manner we find it, but I do not believe we should be so arrogant as to think we are going to curb or stop climate change. We have made great strides in this country to reduce contamination in air and water, and we continue to do so. Having witnessed air pollution in Mongolia where the snow in January is coated in black from the burning of soft coal, I cannot but be thankful for where our industry has come. In many of the developing countries coal is all they have to provide heat, light and energy. We need to continue to develop alternative sources, and to bring them on-line as soon as we can, but we cannot morally harm food production, and livelihoods because of computer programs that are generated with conflicting data. I felt what was on my mind was too much for a comment on the blog page. I hope you will forgive the intrusion and keep me on your list. I do try to be open to where others are coming from and the different values we all hold. I am aware that I, and suspect others, read and listen to what strengthens our beliefs and must work hard to accept where the beliefs, opinions, and values of others differ. Larry — I cannot tell you how grateful I am to you for taking the time to write, and for trusting me and the blog with your story, your beliefs and values. These days we are so quick to put each other categories — my side/the other side. I am fighting that in myself and you are reminding me that there is great variety out there and that “boxes” are not where we belong. I don’t disagree with you on anything, and one reason is the way you expressed yourself. The openness and vulnerability, “the coming out” as you say, imagining that many fans of my blog might be critical, the thoughtfulness and clarity and humility — if we could all model that our conflict resolution practice would be a very different experience, wouldn’t it? I also want to thank you for paving the way, I hope, for others to comment from the heart and mind, both, and not let me get too complacent in my “right” way of seeing things. I am so glad that you will stick with me and my blog.